These generous home-cooked pies can be made in advance. Make sure the chicken and mushroom filling is completely cold before adding the pastry lids, then store in the fridge for up to two days or freeze, wrapped in foil, for up to one month. Cook from frozen for 50-55 minutes at 180°C, gas mark 4. Place the stock in a pan and bring to the boil. Reduce the heat, add the chicken and gently poach in the stock for 15 minutes. Transfer to a plate using a slotted spoon and set aside to cool. Strain the stock through a fine sieve and reserve. Meanwhile, unroll the puff pastry on a floured surface. 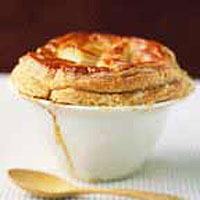 Invert 2 x 13cm round pie dishes onto the pastry. Cut out tops about 2cm larger than each dish. Cut 2 long ribbons, about 2cm wide, from the remaining pastry and press one firmly onto the rim of each dish. Then cut out 6 leaf shapes and place on a baking sheet along with the tops. Chill the pastry for 15-20 minutes or until needed. Preheat the oven to 200°C, gas mark 6. Melt half the butter in a heavy-based pan, add the mushrooms, season and cook gently for 3-4 minutes without browning. Then transfer the mushrooms to a plate and reserve. Melt the remaining butter in the pan and stir in the flour. Add the reserved stock gradually, stirring constantly to avoid lumps. Bring to the boil, then reduce the heat and cook gently for about 5 minutes, stirring occasionally, until thickened. Add the double cream, return to the boil, then simmer for a further 5 minutes until thick enough to coat the back of a spoon. Stir in the mushrooms, chicken, parsley and add a squeeze of lemon juice. Season and divide between the pie dishes, filling to about 1cm from the top. Brush the pastry ribbons with beaten egg, then place the pastry tops over the dish and trim off the excess. Press the edges into the ribbons around the rim. Cut a small slit in the top of each pie to allow steam to escape. Brush the pastry with beaten egg, arrange the leaf shapes on top and brush again with beaten egg. Bake the pies for 30-35 minutes until the pastry is golden. If the pastry is browning too much, cover with foil and continue cooking. Serve immediately.